Black Caucus To Make Final Jobs Tour Stop In L.A.
WASHINGTON - Beginning tomorrow, 13 Members of the Congressional Black Caucus (CBC) will join Congresswoman Maxine Waters, in Los Angeles for the final stop on the CBC’s “For the People” Jobs Initiative, which includes a Job Fair and Town Hall at Crenshaw Christian Center in South Los Angeles. Joining Congresswoman Waters will be the co-hosts of the event, Reps. Laura Richardson and Karen Bass, as well as several members of the CBC, who will discuss jobs legislation and how to stimulate economic growth throughout the country. CBC Chairman Cleaver, who is expected to attend the event, remarked that the catalyst for the creation of the jobs initiative tour was the impact that the high unemployment was having in the black community. He explained, "The Congressional Black Caucus, of which I am the chair began to look at what we can do in terms of reducing the depression level unemployment among African Americans. We came to the conclusion that it was pointless to just complain and growl the government's lack of attention to this segment of the American population that is unable to find work. 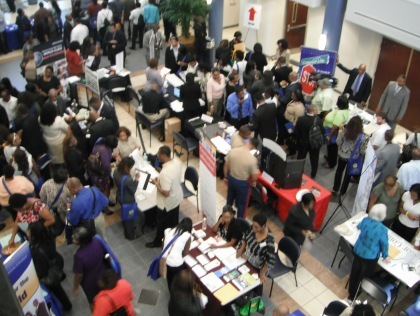 So we decided that we would select five cities where unemployment was high, get major corporation to commit to hiring a large number of those individuals who came out and we would travel around the country with this job fair," Cleaver said. At the completion of the initiative, Members of the CBC will have traveled to five cities during the CBC Jobs Initiative. Thousands have already gathered for town hall meetings, job fairs, job readiness workshops, and seminars as a part of this initiative. Other CBC members scheduled to participate in the Los Angeles town hall and job fair are: Reps. G. K. Butterfield, Andre Carson, Yvette Clarke, Lacy Clay, Jr., Sheila Jackson Lee, Hank Johnson, Barbara Lee, Cedric Richmond, and Frederica Wilson.